The section of the B&O’s “West End” that I am modeling was known for its heavy grades. The grades mattered because of the primary commodity carried over the line – coal. The challenging and long Cranberry Grade faced the eastbound tonnage; while the short but equally steep Cheat River Grade impeded westbound trains of empty coal hoppers. During the steam era on the prototype, eastbound trains of hoppers were limited to 55 cars because of the grades; and then proceeded up Cranberry at less than 10 mph. Road power in the late steam era was an EM-1 2-8-8-4 up front and pushers on the rear which could be one or more EL class 2-8-8-2s, Q4b 2-8-2s or an A-B-B-A set of F7s. Superficially, this is all that you need to know to model this section of the line. Assemble a reasonably long train of loaded hoppers, slap an EM-1 on the point, put some helpers on the rear and you’re good to go. This was the operational concept of my railroad at its inception, and still is. However, I’m the type who wants to know more, specifically the why and the how of coal operations, to make my railroad more accurate without going overboard to reproduce the exact operations of the prototype down to the smallest detail. Collecting the data to enhance my coal operations has been a long, on again, off again effort; but I believe that I now have a better picture of the composition of a late steam era coal train. While we model railroaders think of hoppers in connection with transporting coal, the industry referred generically to “coal cars”. Through the years many car types carried coal, not just hopper-bottomed gondolas (the proper name for what we call hoppers). 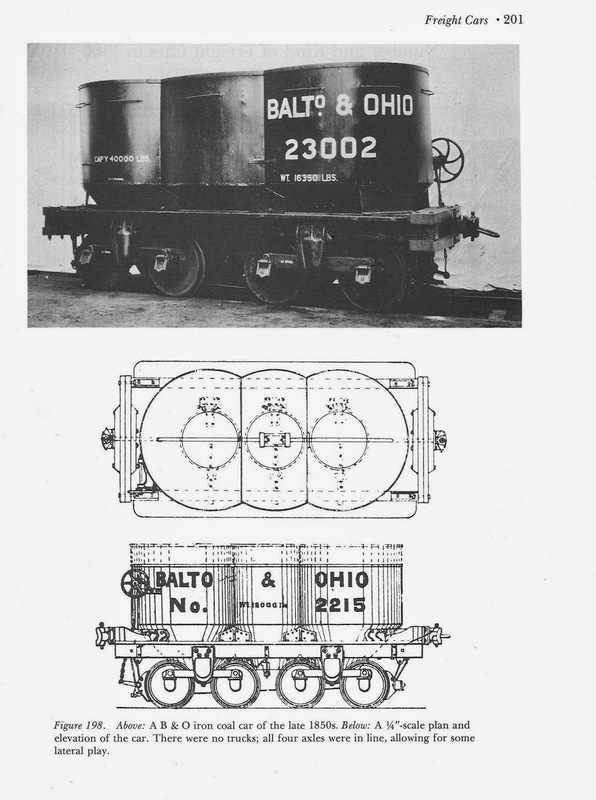 Solid bottom gondolas, drop-bottom gondolas, “battleship” (70 & 100 ton) gondolas and, going back to the beginnings of the B&O, the “pot” hopper, all were used at one time or another for the transport of coal. By the early 1950’s the hopper, in its many variations, reigned supreme. The gondolas, having fallen into disuse because of the cost of unloading, would make a comeback in the future with the proliferation of rotary car dumpers. But what hoppers should be in your trains? Some modelers would put together a train having hoppers from a number of different railroads and think nothing of it. However, I got to considering the prototype situation. Coal was an inexpensive commodity and it could be made uncompetitive if the price of transporting it was too high. If the originating railroad used any hopper that was available they would have to pay a per diem on foreign road hoppers for each day that they were on its rails. The per diem would increase the cost of transporting coal and, therefore, its selling price. Some railroads owned mines and sold coal; they would certainly have been sensitive to the cost of producing and transporting said coal. In addition all railroads had to publish tariffs (rates) for transporting various commodities. The rates for carrying coal had to be based on some assumption as to the cost of supplying coal cars. For all of these reasons, logic would seem to dictate that most coal would be carried in the company cars of the originating railroad. I had never heard of this topic discussed in the model press (that does not mean that it wasn’t done, just that I had never read about it). Could I prove my suppositions? My on line searching eventually turned up this report: From Mine to Market: The History of Coal Transportation on the Norfolk and Western Railway. Although this report is not specifically about the B&O, it deals with the same region, and the time frame is about right. By this point in time car allocation and tariffs were being overseen by the Federal Government (ICC) and some state governments; so a certain uniformity of practice across the railroads would be expected. Coal car shortages occurred from time to time. At these times the railroads could not supply the mines with all of the cars that they requested. To assure unbiased allocation of cars during shortages, the railroads had to rate the output of the mines and allocate cars in proportion to each mine's capacity. The mine owners, acting as a group, eventually had a say in approving the allocation scheme and its revisions. Cars for railway fuel and private cars are sent to the mines to which the car's owner designates. Those cars are counted against the mine's request for cars or against its allocation of cars in times of shortage. The balance of the mine's request for cars or its allocation in time of shortage is typically filled by the originating road's cars. The report goes into detail on the various systems that the N&W used, objections by the mine owners, court cases and other details necessary for the historian. But the bullet points above are what we need to know as modelers. In fact, it's the last three bullets that tell us what cars should be in our coal trains. Cars for foreign road fuel should be from railroads that do not have large on-line coal mines. Roads that have on-line mines would patronize the local mines for the goodwill and for the shorter haul. Nor would it be likely to see UP, CB&Q or other hoppers from the west taking on coal in West Virginia; there are certainly mines closer than that. On the other hand a NH hopper would be OK inasmuch as by this time there were no economically competitive coal mines in New England. This picture of a train on Cranberry grade seems to bear this out. Most of the cars in this photo are indistinct but there is a P&LE hopper in the foreground and there appear to be N&W H30 hoppers in train. Otherwise, most of the cars appear to bear the B&O's 13 Great States logo. The rules outlined in the N&W report raise some interesting possibilities for prototype based car routing and allocation. In normal times, empty cars delivered to the mines should match my hypothetical 85-10-5 ratio. But, for instance, you could have a large coal mine on your layout that receives a large number of private cars for a consignee. In that case your 5% private cars could be more, conceivably a lot more, if the mine is a large source of carloads. You could also declare a car shortage for some operating sessions and reduce car deliveries to all mines. Just remember that private cars and foreign road fuel cars are not subject to allocation and should be delivered in numbers similar to a normal operating session. In fact, figuring this all out could give rise to a new role at your operating sessions for someone who does not care to operate but prefers mental gymnastics. What about hoppers in through merchandise trains? Here I think that you have some leeway. 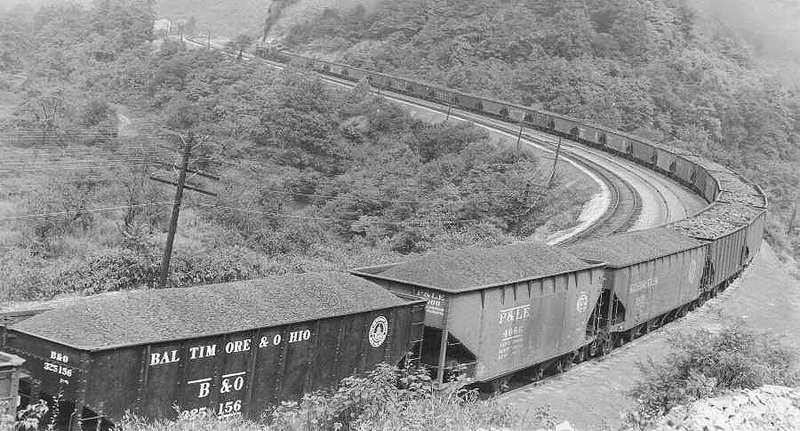 After loading at the mines, loaded hoppers would fan out across the country including for destinations within coal country. Individual coal dealers could buy from various mines located anywhere because of: cost, the coal type (bituminous vs. anthracite), merchandising features (e.g. "Blue Coal"), or local shortages. So a through train (as opposed to a solid coal train) could have a hopper from anywhere within reason. 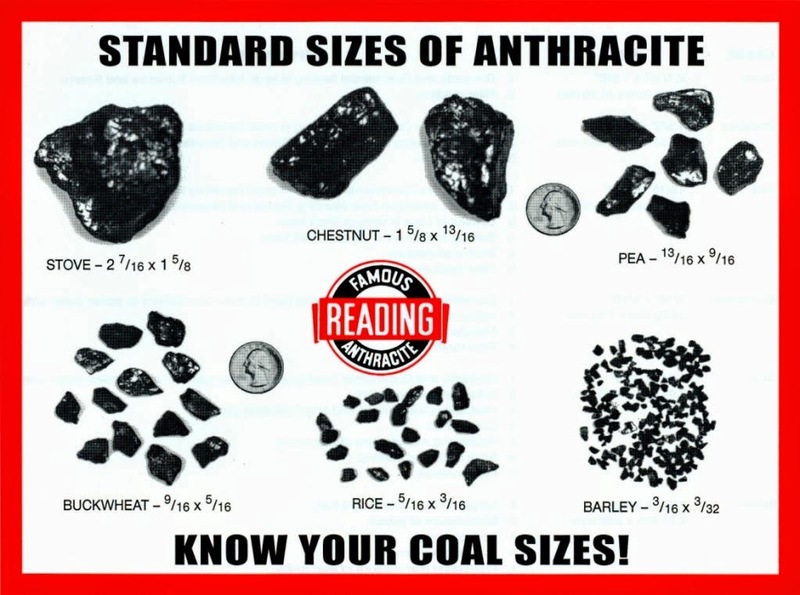 For instance, I would not expect to see a UP hopper delivering coal to the east coast; but a hopper from any of the anthracite roads (CNJ, LV, RDG, DL&W, LNE, and LHR) could be found anywhere because of the desirability of anthracite for home heating. You also would have to watch the direction that a loaded through hopper is travelling. You would not expect to see a loaded RDG hopper moving east from say, Illinois. During coal's heyday as a multi-purpose fuel, the size of the coal nuggets was tailored to the application. 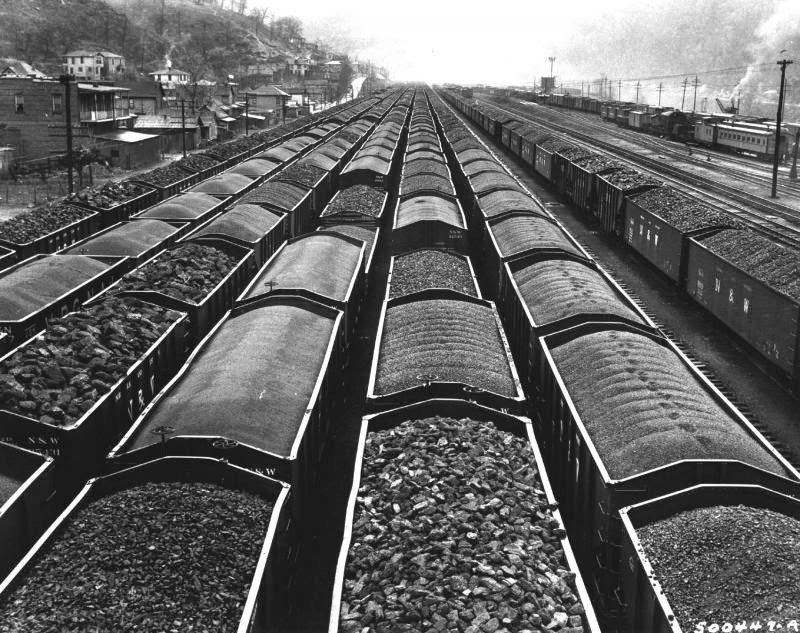 The primary purpose of the coal tipple above the loading tracks was not, in most cases, to store the coal prior to loading; but it was to screen (and sometimes break) the coal into carefully graded sizes. Coal would be passed by tables where men would pick out shale and other contaminants from the coal flowing by. Then the flow of coal was passed over "screens", metal plates with circular holes, which would let coal nuggets of a given size fall through. First over the smaller screens then the larger ones. Smaller mines (like truck load-out mines) which could not screen the coal would load "run of mine" coal; that is, coal sized in whatever mixture of lumps that emerged from the mouth of the mine. Run of mine coal would also have impurities still in it and was considered the lowest grade of coal. Conversely the smallest size of coal was called "slack" coal and it was sometimes stored in a cylindrical storage bin outside of the tipple until loaded into cars for shipment. The various sizes of coal the mine was producing for that day would be held in bins above each loading track under the tipple. Only one grade of coal would be loaded on that track. 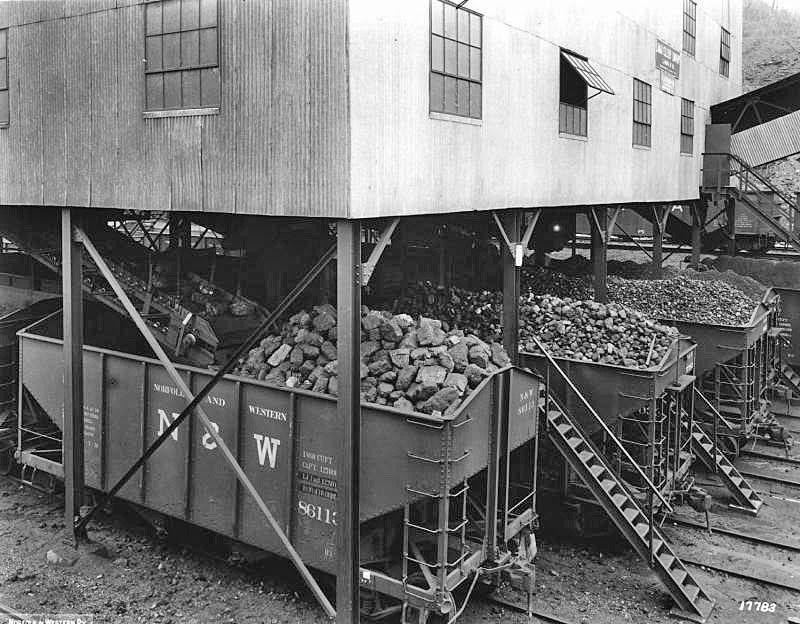 So to be prototypical, the loaded cars on each track should have the same size coal and different tracks should have different sizes of coal as can be seen in this picture from the N&W. Carload lots of coal should be nearly uniform in size - unlike many model coal loads which have lumps of widely varying sizes. Your assembled trains of loaded hoppers should reflect this too with different cars carrying different sizes of coal, as seen below. What does this mean for your model hopper fleet? If you want to look prototypical, I don't think that you can do it with readily available model coal loads - certainly not the injection molded "loads" that come with many model hoppers. I believe that loads made from loose "coal", of varying scale sizes, made to fit you hoppers, is the way to go. To see what I mean, here is a picture of a hand-made, scale sized (egg size in O scale, in this case) on the left and an injection molded "coal" load that came with the Atlas O hopper on the right. Each track at your tipples should have cars with a single size of coal. And any mine of significant size should be loading several sizes of coal, each on a different track. If you swap loads into and out of cars to change them between loaded and empty, you may want two or more loads of different sizes of coal so that each car does not always carry the same size coal. At the receiving end, any particular consignee could require one or more specific sizes of coal rather than just a "carload". Providing cars in the proper numbers, picking loads based on some model of a mine's output and matching carload type to a particular receiver could constitute an accurate model of coal operations. Thought of in this way, accurately modelling coal operations can be a game within the "game" of model railroading.